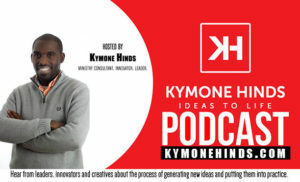 In the Ideas to Life Podcast, Kymone Hinds interviews leaders, innovators and creatives about the process of generating new ideas and putting them into practice. If you are an entrepreneur looking to develop your business, a leader seeking to grow your team, someone seeking to make a difference where you are, a writer looking to get your message out, or anyone with an idea that needs to be developed, this podcast is for you. Hear stories and principles from people who are making a difference simply by pursuing their dream. We release a new episode every week and you can download episodes on demand. Subscribe so you can know when the latest episode has been released.